Fill bottle with water. Shake. It really is that easy! Make some extra to gift to your neighbors, family & friends. The fashion show was so much fun! Thank you to all of our wonderful models! Click the link above to see pictures by Mel Sauerbeck! 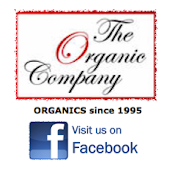 Click the picture below to see some of the styles on our website, TheOrganicCompany.com ! 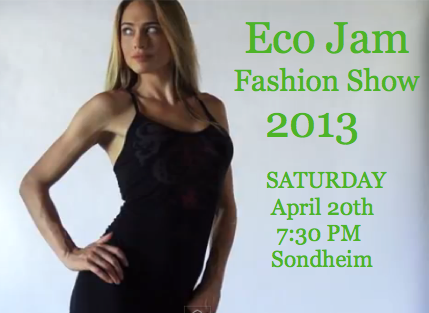 We had a great rehearsal tonight with 12 local models for the Eco Jam Fashion Show, THIS SATURDAY, 7:30 PM at the Sondheim in Fairfield, IA! There are a variety of local designers being represented and we are very happy to open the show with Organic Cotton and Bamboo Yoga Wear by Green Apple Active - much of which was designed by my sister Ananda Bhavani! 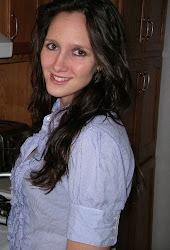 You can click her name to see some of her gorgeous, colorful work! We are also showing Fair Trade Silk/Alpaca Knits from Indigenous Designs. This should be fun! 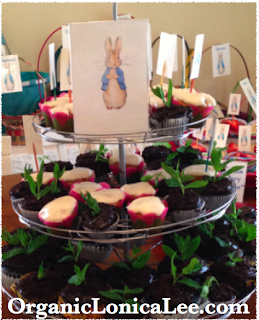 My 5 year old daughter Alexis had a Peter Rabbit theme party, and I made these to look like little growing plants. They would be cute in mini flower pots if you can find them! This is the first recipe of vegan cupcakes that my whole family loved! 1. Preheat the oven to 350 F. Line 12 cupcake liners. 2. In a large bowl whisk all the dry ingredients. 3. In a small bowl, whisk all the liquid ingredients. 4. Pour the wet ingredients into the dry ingredients. Whisk until everything is well mixed. Do not over mix. 5. Fill the cupcake liner about 2/3rd full. 7. Cool the cupcakes completely before you frost, so that they are nicely set. This time, I used these ingredients and I just mixed them all together in the Kitchenaid stand mixer until the consistency of the frosting was right, and I liked the taste of it - adjusting it as was necessary. Blend the frosting, and possibly place in the fridge to cool down and firm up. Stick a toothpick in (and take out immediately) each cupcake to make a tiny hole. Stick one Mint Sprig in each cupcake. 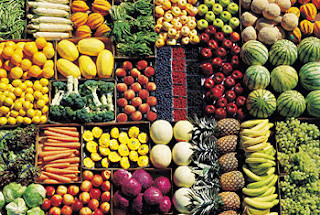 Most Vegans love healthy food so much that they easily get a wide variety of colorful fresh fruits and veggies! 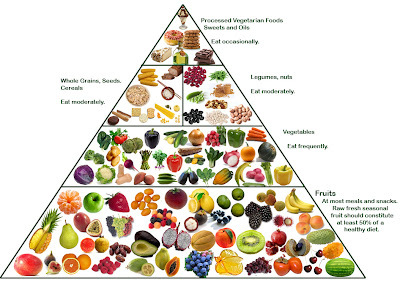 Here, the Vegan Food Pyramid (from http://naturallyfitandhealthy.blogspot.com/) is beautiful too! Vitamin B-12 can only be found in the vegan diet if it includes fortified grains and soy products. Vitamin B12 helps transport red blood cells, which supplies oxygen to the body and without it, you are susceptible to anemia, which is already common because of today’s diet of prepackaged and nutrient-empty fast foods. 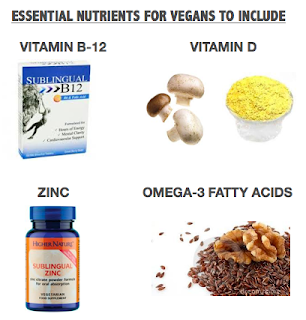 Vitamin B-12 supplements vary in effectiveness. Sublingual (absorbed under the tongue) seems to me the most effective. This one has a pleasant cherry taste that even kids will like! If your supplement is working well for you, you may notice improved energy. Zinc is responsible for proper immune and digestive functions, and seems to prevent colds. Sublingual (absorbed under the tongue) seems to me the most effective. 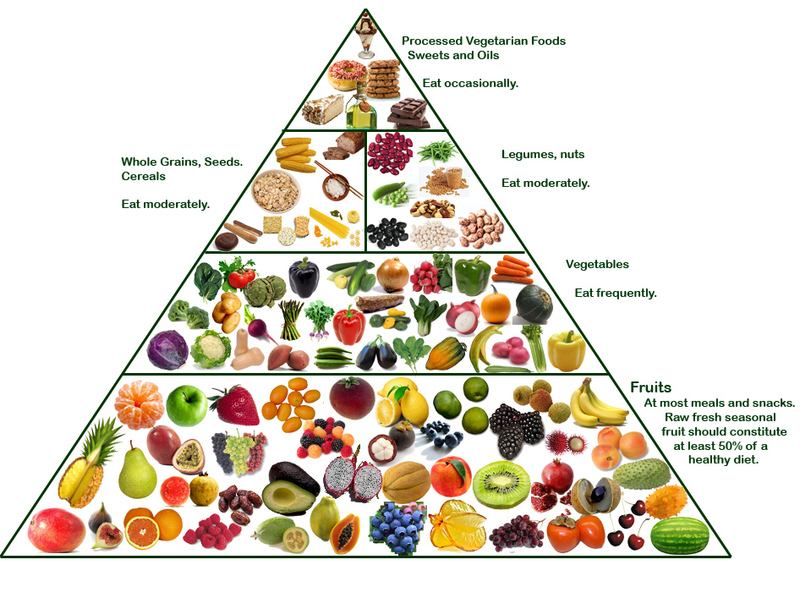 Omega-3 Fatty Acids Omega-3 rich foods assist in brain function which can reduce symptoms of depression and memory loss. 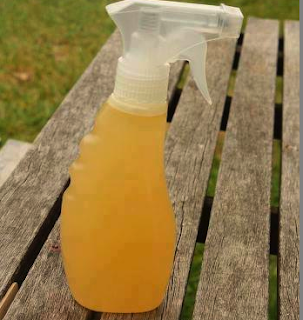 They can also reduce inflammation in the body which prevents certain chronic diseases. Eat Walnuts as a snack, sauteed with your veggies, or blended in a smoothie, and Flaxseeds, or Flaxseed Oil over a salad!